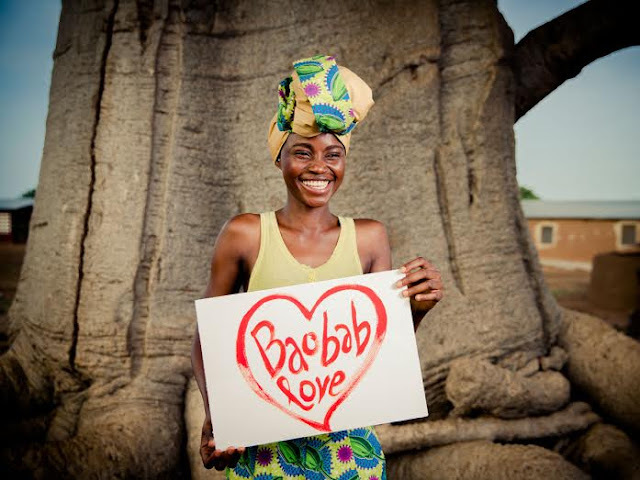 Make Baobab Famous & Win a Year's Supply! | A Blackbird's Epiphany - UK Women's Fitness and Fantasy Writing Blog: Make Baobab Famous & Win a Year's Supply! I touched on baobab and its health benefits a little while ago, as well as offering a few recipes, but while the recipes spread around Pinterest like wildfire, a lot of people were unsure where to actually find baobab. It's not exactly sat next to the plums and apricots in your local supermarket. In fact, your local supermarket probably doesn't stock it at all, instead you're better off going straight to a supplier like Aduna or a small number of health food shops. And it's the lack of availability that I'm going to talk about briefly today: Aduna have managed to get themselves into the final 10 brands in Pitch To Rich, Richard Branson's event aimed at bringing small businesses into the limelight with the ultimate goal of winning £250K to spread the word and create demand for underutilised natural products from small producers in Africa, and they're starting with the baobab fruit. To get into the semi-finals is amazing as it is, and does suggest already that they've caught a lot of well-deserved attention, but the goal is, as I've said, to win, and by winning Aduna will be able to further their work and get their product onto many, many more shelves and in the process help small businesses and communities in Africa flourish. The baobab is sourced directly from 1000 female baobab producers in Ghana’s poverty-stricken Upper East Region, where, thanks to Aduna's project, the average annual incomes have increased from £12 to £120. But it's still not enough. So they need your vote. Aduna is a wonderfully ethical company that I truly support from the bottom of my heart, and they're also really friendly, too! There are no baobab plantations, the trees are ancient and enormous, taking hundreds of years to grow. It's far from practical to try to grow them and so they're the property of the communities in which they grow instead. The baobab is also the only fruit in the world that dries on the branch - while any other fruit would rot once ripened, baobab dries in the heat instead and then falls to the ground, all of its pulp and goodness preserved, and is them simply sieved into a powder. Other powdered fruits on the market did not dry naturally and instead have been treated with chemicals and the like - albeit mild ones - but they lose a part of the fruit's goodness in the process. Baobab remains pure, which means it keeps its antioxidant content, its vitamins and all the health benefits you'd expect from the exotic fruit. And, being a powder, it is extremely versatile in baking, cooking, smoothies and all kinds of things. From simply mixing a teaspoon of the fruit into a bowl of greek yogurt or adding it into your porridge (which you simply must or you're seriously missing out), all the way to adding it into cakes in place of vanilla essense or making a deliciously sweet sauce to accompany desserts, it's such an easy way of adding a little extra fruit into your diet without even noticing it. The powder goes further than you'd think, too: a standard 80g tub lasts me a month in porridge! Voting for Pitch To Rich closes on the 16th of June - just 4 days. You need only click 'vote', enter your email address and make sure to verify it in the verification email you'll be sent almost immediately. 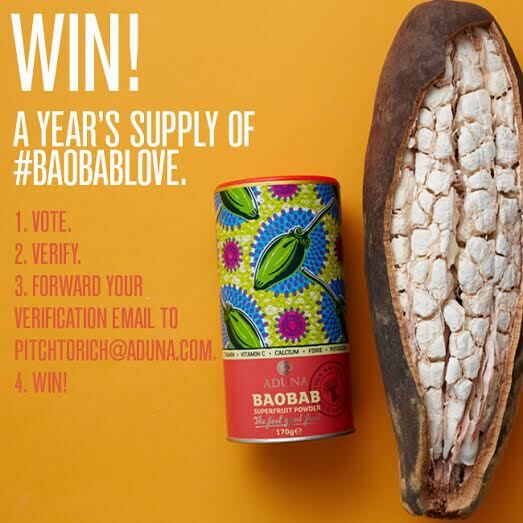 Plus, to top it off, if you forward your verification email to pitchtorich@aduna.com you'll be entered to win a year's supply of Baobab! So head over and support Aduna and, in the process, support African communities. Make it your good deed for the day - it won't take you a minute. Just make sure you follow the simple instructions in the verification email for your vote to count.